To date all of my longer (100km or more) one day rides have never taken me too far. I have kept firmly within Kent and East Sussex. They might not all started or finished at home, but at worst have only involved a short train ride or drive at the start or end of the day. However a few weeks back, after getting a bit of inspiration from some cycling forum sites, I found myself making some tentative plans for something a bit different. Before I knew it the plans were finalised and maps bought (I never need an excuse to spend some money with the Ordnance Survey). With my other half being away for a weekend a date (the Saturday in question) was fixed..
On the Friday night I made sure that everything was packed and loaded into the car, including the bike. I went to bed stupidly early for a Friday night ready for the day ahead. The alarm went off at 5am. I got dressed into my cycling gear and then straight up and into the car which I pointed west along the South coast. I Stopped briefly in Chichester for a healthy McDonalds breakfast and to fill up with petrol. Back on th eroad and with the roads being nice and quiet at that time of the morning, I was soon parking the car up in the car park at Gunwharf Quays in Portsmouth. I got the bike out, checked it over, put on the rest of my kit and rode across to the harbour station. With a bit of time to spare I took a quick spin around the harbour before getting my ticket and preparing to board the 8.15 ferry to Ryde to begin a circuit of the Isle of Wight. It was a beautiful clear morning and the Solent was mostly still so I stood on the top deck of the Catamaran admiring the views all the way across to the Island. The Portsmouth to St Malo ferry was following us out of Portsmouth and the Solent Forts were clearly visible to the port side of the ferry. I got ready to disembark as we docked up alongside Ryde Pier. There were a couple of other cyclists on the boat as well who were also doing circuits of the Island. They both looked like they were going to be riding faster than me (expensive bikes; thin wheels; no paniers; probably just going heads down rather than taking a good look at the countryside around them) so I let them go in front of me off the boat. They were both well gone before I had taken a photo at the starting point and triggered up my GPS. The route I would take would be largely following the main ‘Around the Island’ route but not entirely so. Although I was sure that there would be good reasons (hills, busy roads, etc.) it struck me that the main route did not follow the coast quite as much as one might expect for a round an island route. I had guessed (correctly, fortunately) that a Saturday in March would not be the busiest day on the Island which also helped my plans. The main route bypasses Ryde entirely so I had to make my own way out of the town. 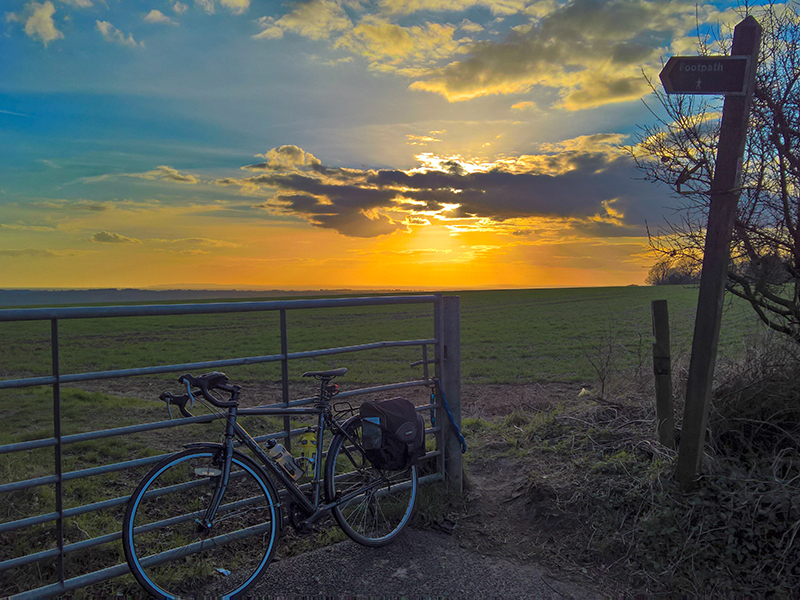 A short climb out of Ryde warmed the legs up and then I turned onto the B road headed towards Nettlestone. A lovely winding road with regular ups and downs gave a good indication of what would be mostly ahead of me for the day. From somewhere near to Nettlestone I picked up the main route which I would be using for a miles now so I followed it through St Helens and Bembridge and along the side of Culver Down; all of which were lovely early miles in the fresh morning air. I had already stopped early somewhere around St Helens to remove my coat and stuff it into a bag – I could quite happily have left it at home but never mind; it doesn’t take much weight. At a roundabout a few yards after passing the road to Bembridge Fort (which was not open today; saving me some extra feet of climbing as I would not have been able to resist) the route goes straight ahead. Instead I bore left heading into Sandown from where I could follow the coast through to middle of Shanklin. Living as I do in a seaside town that is doing an excellent job of rejuvenating itself and giving itself a new lease of life, it was slightly sad to see that both Sandown and Shanklin are looking quite faded. I should imagine that they will pick up at some point; however much of the island shows a lack of recent investment. The coast and beaches are glorious so they should thrive, but buildings such as the Grand Hotel at the entrance of Sandown and the sorry looking state of its pier (a whole day’s fun in one apparently) were not too welcoming. Between Sandown and Shanklin I followed the sea front prom; a shared cycleway/footpath. There were quite a number of people making use of it and I can understand why. The path is lovely. It follows the beach directly underneath the cliffs. Carefully dodging past people I made slow but steady progress. I was more than happy to reduce my speed to make the most of this stretch; something that those on the main round the island route will not get to experience. Coming into Shanklin I ignored the cycle route sign pointing me into the town; purely because it involved a steep but brief climb up onto the cliffs. Instead I rode on a short way along the prom before checking the map and realising that I should have followed the signs. Still, I had got to see a bit more of Shanklin prom including the cliff lift which was closed when I visited; I hope that was just seasonal. The climb up was fine as it turned out and, with my selected route, I knew I was going to be climbing soon enough anyway. Out of Shanklin I joined the main A road and rode sharply out of the town towards Ventnor. After a short stop near the top to admire the view back from where I had come (not just to take a breather. Oh no!) the road winds nicely around before dropping back down into Ventnor; a place I previously only knew of as a stop by the Irish band Ash on their ‘A-Z’ tour a few years back; a poster for which we have in our hall at home. From Ventnor I would suggest that not following the main cycle route is definitely a good idea. A roadslip a few miles past the town closed the main road a few years back and the signs are that it will never be reopened. Instead the traffic is diverted along B roads further uphill whilst the former main road (Undercliff) is now a lovely quiet glide around the cliffs about half way up them. After a couple of miles I came to the area where the road had been lost. It now comes to a stop; however a narrower piece of footpath and cycleway has recently been opened thus allowing for easy and unhindered riding. The lack of repair to the road shows further evidence of a wider lack of investment in the island but it does make for a nice cycle route. Towards the end of the Undercliff road a short but easy going climb back up to the cliff tops bring you into Nilton and back onto the round the island cycle way. The route follows the main road again here for a few miles as it climbs up onto Blackgang Hill. I stopped at the viewing point here and had considered a walk up onto the hill top to look at St Catherine’s Oratory. It was further off the road than I had anticipated however, and I didn’t want to carry the panniers or leave them unlocked on the bike in a busy car park. Instead I just admired the views and had a chat with a local cyclist who tried to encourage me to come back in a few weeks for the Round the Island Randonnee ride. That was certainly tempting but I’m not able to do so; though reading about the ride and realising I couldn’t make the date were major reasons as to why I was there today. After dropping down from Blackgang Hill the main route heads inland a short way onto quieter roads but as the traffic was still looking pretty light I decided to stick with the main road; the military road running along the cliff tops and the seafront from here to the village of Freshwater. One of the main tips I had received was to choose whether to ride clockwise or anti clockwise depending on the direction of the wind along the exposed military road. Today was a windy day and though riding clockwise would mean heading into the north easterly wind for the final quarter of the ride I could see the benefit of the decision (though the wind was as much across me as behind so it wasn’t a total “breeze”). Folk I saw riding the other direction certainly looked like they were struggling at times. The stretch along the military road is one of the longer bits of road on the island and at over 10 miles it is certainly the longest straight on this ride. It isn’t arrow straight but feels quite like it. I was grateful for the slight push from the wind as the miles gradually ticked by. The day was getting warm and my legs starting to tire. I pulled in to the car park at Compton Chine where an ice cream van sold me a couple of bottles of water from I which I filled my bike bottles. Pulling out of the car park the road starts to climb as the steady cliffs of the south side of the island transform into the steeper chalk hills of the west part around the Needles. At the top of the cliff the road levelled out for a bit, rather too close to the cliff edge in places, before a sharp descent into Freshwater Bay. I made the most of the open road, recently resurfaced, and clocked up 42mph just before entering Freshwater. At Freshwater the round the island route heads north cutting off the corner towards Yarmouth. For me though it didn’t seem right to tour around the island and not head towards the iconic Needles headland. I therefore hung a left on the way out of the village and began a long and arduous climb up the hills. The actual ride up isn’t probably too bad but by now I was tired. I had passed a nice looking café in the village and was regretting not having stopped. I should have listened to my legs rather than the stupid part of my brain telling me I needed to push on to the Needles before lunch. I admit I struggled in places but eventually made progress. The Needles itself is one of the island’s main attractions and for the last mile I joined the main road to it and a busy line of traffic heading to the car park. From there, however, cyclists are allowed to continue where cars are not on the path towards the headland and the old ‘battery’ sites. Aiming for the better views I followed the road around up a couple of mountain pass style hairpins before almost collapsing in a heap by the upper battery site. I parked up, took some snacks from the panniers and wandered the final yards to the viewing point from where I could get my glimpse of the famous chalk stacks. The day was totally glorious now, if still windy. Despite being shattered it was worth the effort. I also took a look around the ‘secret rocket test’ site before getting back in the saddle. Despite my hunger I chose to pass by the tourist cafes by the car park and continued on the largely (but by no means only) downhill road back the way I had come towards Freshwater. There I found my way back to the café that I had passed earlier. The Piano café was popular and full and with good reason, but I ordered some food and propped myself at the bar with a long cold drink until a table became ready where I could eat a lovely chicken wrap and salad. I would certainly not hesitate to recommend the place to anyone doing the round the island ride. My only regret was that I should have stopped here when passing the first time as, welcoming though the food was, I could tell that I should have had it sooner as my legs were quite drained and I was still only a little over half way through the day. However I was refreshed and ready to continue so, having again filled my bottles, I headed back on my way. From here on I would be following the main route all the way back to Fishbourne, where I would finally leave it in order to head back into Ryde. The route to Yarmouth follows an old train line alongside the River Yar. It makes for a nice few flat miles and allowed me to get my legs warmed back up a bit. Yarmouth Old station is now a café/restaurant and looks as though it would have been a nice place to stop had I not already been to the Piano Café. From Yarmouth the route turns East and so I started heading back into the wind. From here I was onto some quiet country lanes but tiredness and the wind started to take their toll. I was finding keeping a steady rhythm difficult but managed to keep the miles ticking over through Wellow and Newbridge. From Newbridge the route starts to bear north easterly as it points towards Cowes. After crossing a pretty creek the route passes into the tiny hamlet of Newtown and past the ‘town hall with no town’. Newtown was started in the 13th century and was planned to be a major port town. It started to thrive but soon declined again and now only a handful of houses remain. The next five miles were a bit more of a drag; though the scenery was lovely, rolling up and down the hills before riding down into Gurnard Harbour on the western edge of Cowes. I was hoping for a flat ride through the town now but there was another up and down before hitting Cowes Esplanade. Further along the front I followed the cycle route signs. I might suggest to others that they might wish to reconsider. Rather than follow the seafront the route suddenly dived back up inland and up some more steep hills. The route makes a variety of twists and turns and drops and climbs before finally heading down to the Cowes chain ferry. I am sure that there must be a more friendly way to get to it. At the time that I was on the island the main chain ferry was out of action. It was in the process of being replaced with a new one and the slipways are also being improved to house the larger boat. However a small passenger (and bike) ferry was doing the trip instead. Throwing the bike onto the small but high sided boat wasn’t easy but I was soon across and getting off at East Cowes. I had planned on a coffee and cake stop but didn’t spot a single establishment so instead started the next climb up from the river side along the main road headed out of the town past Osborne; Queen Victoria’s House. Half way up the hill my legs almost completely gave up the ghost and my left thigh cramped up. I had to throw myself off the bike and massage my leg. I feared the worst at this point but strangely the cramp seemed to help and once I’d sorted myself out I felt a lot better. The next five miles to Fishbourne went well and I got my mojo back for the final push. At Fishbourne I left the round the island route to head back into Ryde. I turned towards the car ferry and just past it a turning to the right takes you onto a well surfaced footpath and cycle way for the final two miles to the edge of Ryde. The route passes the old and new Quarr Abbeys. The first of the Abbeys is the current Benedictine monastery (it has a tea shop but was closed by the time I came by and I was close enough to the end anyway) and just beyond are the ruins of the medieval Cistercian Abbey. From there a short ride across a golf course brought me to the western edge of Ryde. A final few streets dropped me down through the town and there was Ryde pier in front of me. Riding along the pier felt great. The sun was dropping (the clocks were to change the next day) and the sunset was stunning. I was proud to have finished the ride. It was by no means the longest I have undertaken and not the hilliest but it was still a tough 100km whilst still carrying my post Christmas bulk. I had about half an hour to wait for the ferry and grabbed a welcome coffee and a bun from the Costa Coffee at the ferry terminal. The sailing back to Portsmouth was as smooth as the way out but it was now dark and getting cold so I stayed inside the boat. Back at Portsmouth I rode the short way back to the car park, loaded the bike into the car, got changed and walked back into Gunwharf Quays. Back in warmer clothes I made the most of the weather and settled for some food at an outside table at Wagamama. One Katsu Curry later and I headed back to the car and the drive home. What a great day.